Follow up on Chuck's photo of the historic, and now-crumbling, Trinity Church in Albany: Chuck's gathering a photoset of the building's gradual demolition. It's interesting -- and good -- to see the effort involved in saving elements such as the stained glass windows (speculated to be Tiffany windows). But in some ways the almost brick-by-brick demolition of the historic building seems sadder than one big boom and a cloud of dust. I hope they're saving some of the beautiful wood from inside there also. Would be a shame to waste it. There are several systemic problems which brought about this loss of a significant piece of Albany's historic architecture. One of them is the property auction process. Not only was Trinity Church sold at auction for almost nothing to someone who had no clue about how to preserve the building, the same thing happened to St. Joseph's Church on Ten Broeck Street. Residents will recall that a few years ago, that magnificent piece of architecture was sold to a local restaurant owner who likewise had no clue about the costs of structural stabilization. She simply thought that she could use St. Joseph's as a banquet hall. 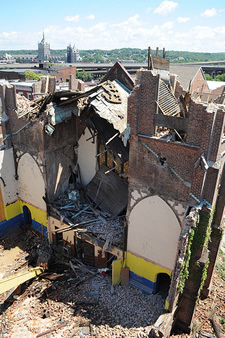 Fortunately, she was forced from ownership as the building began to collapse and Historic Albany Foundation was able to step in and stabilize the building. When will we have the next example of a historic building being sold to someone with no preservation plan, and no access to sufficient money to implement one? There needs to be clear conditions for the sale of these buildings. It is not like Albany has not faced this issue over and over.